Sriracha is the hottest thing on the internet now. No, really, it’s hotter than Matt Cutt’s rant on Guest Blogging Is Dead. 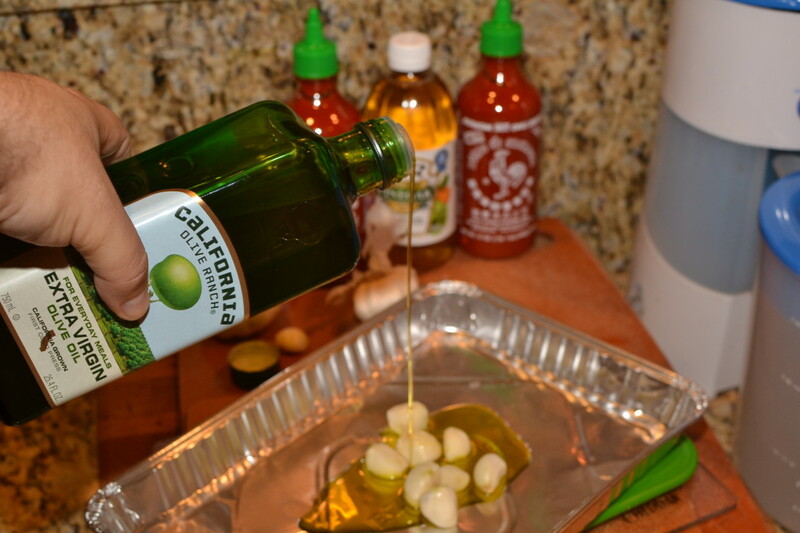 And, with the Superbowl coming up, every food blogger is talking about their Sriracha Appetizers for the big game. My favorite Superbowl finger food is chicken wings! 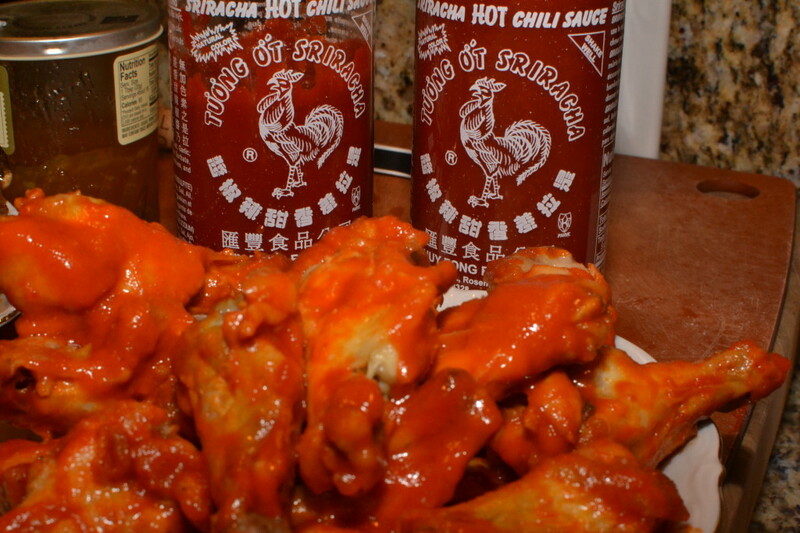 So, I found three chicken wing recipes perfect for the Superbowl, two of which are made with Sriracha. I then, of course, paired wine with them, because that’s what I do. Touchdown, Sriracha! I went with three red wines for the Superbowl appetizers this year. I’ve previously written about Wine and Wings, and stand by my pairing of Riesling with hot wings. Riesling is the perfect white wine to pair with spicy foods, as the fruit flavors and residual sugar balances the heat perfectly. However, some people don’t want balance, they want heat. And lots of it. So, I picked red wines that keep the heat hot. We’ll look at those wines after the wings. The first Superbowl appetizer hails from Honestly Yum’s Sriracha Oven Friend Chicken Wings recipe. Her complete hot wing recipe calls for Sriracha, butter, jalepenos and cilantro for the sauce, and cooking the wings on wire racks in the oven. She has this nifty method for making the skin crisp while baking, and it would have been cool if I was patient enough to try it! Unfortunately, I was cooking three different types of wings at once, and had no patience for wire racks. I threw all of my wings on a cookie sheet, cooked them for 20 minutes, drained the fat, flipped the wings, and cooked for 15 more minutes, all on 475 degrees. They may not have been as FABU as Honesty Yum’s wings, but they were darned tasty. My son absolutely loved these wings, as did I. We didn’t garnish with jalepeno or cilantro, and they still rocked. These wings are not for the faint of tongue however, because they’re seriously hot! 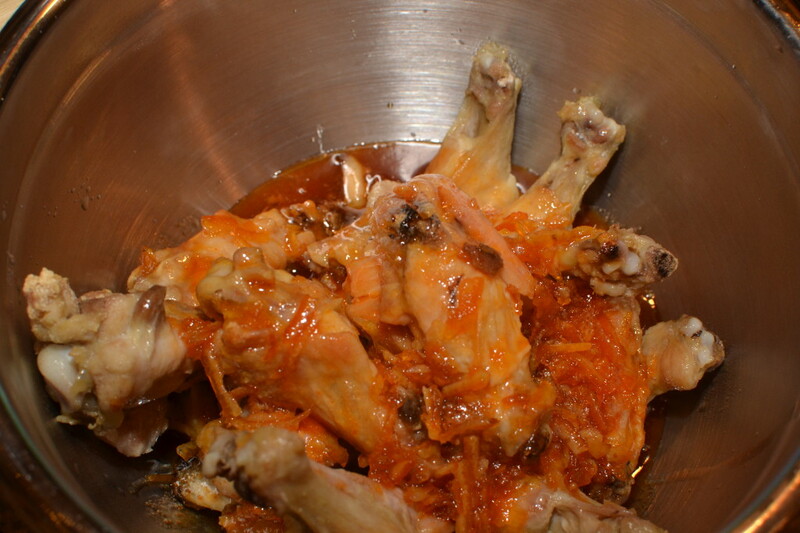 The second Sriracha Chicken Wing recipe comes from The Little Kitchen. She puts together a sweet and spicy sauce for her oven baked wings that I liked. While I enjoyed it, I felt it was a tad light on the heat. 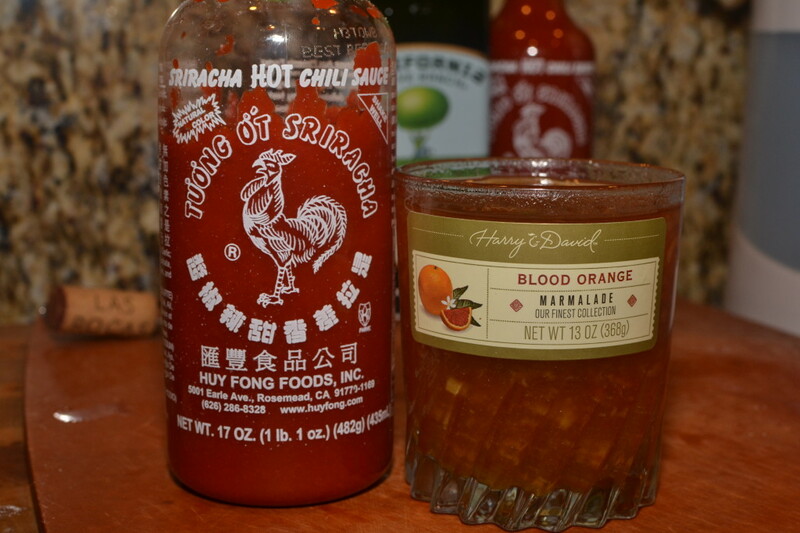 Had I had time, I would have messed with the ratios a little, upping the Sriracha a touch, and reducing the Harry & David Blood Orange Marmalade a touch. You definitely want to check out her blog, because she prepares the wings by boiling them first, then oven baking them. She claims it makes an awesome, crispy skin, and I am sure it does! Again, I didn’t do that, since I was pressed for time. Though any old orange marmalade will do, I was very glad that I had a jar of the marmalade left over from my 2012 visit to Harry & David in Oregon. The quality ingredients made these Sriracha Spicy and Sweet chicken wings rock. The last recipe that I made tonight was From Gate to Plate’s Parmesan and Garlic Boneless Chicken Wings. Oh. My. GAWD! Hands down, these were everyone’s favorite wings tonight. It wasn’t just the fact that they were boneless wings, because I used the same chicken in all three sauces. The sauce just rocked, and everyone agreed. 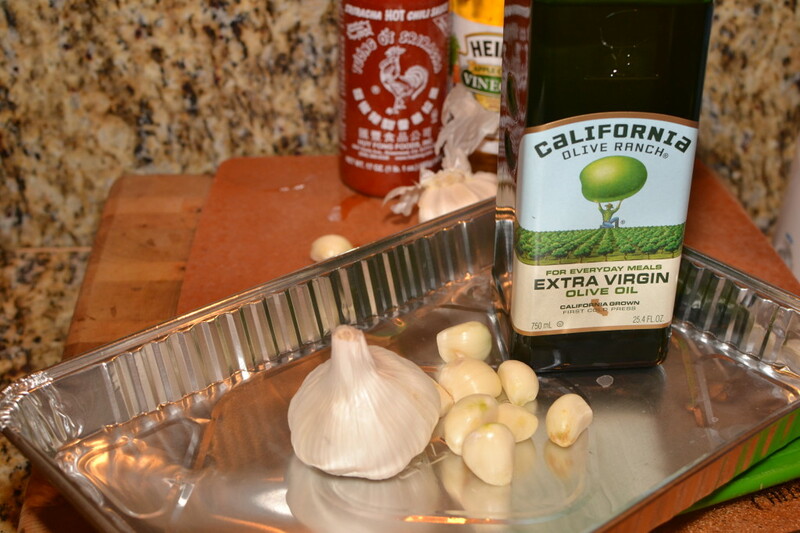 The Parmesan Garlic sauce required you to bake 8 cloves of garlic for 20 minutes, then mix together a number of ingredients with that garlic, like mayo, corn syrup, apple cider vinegar and more. I short circuited the process by using a small disposable aluminum baking pan, instead of a big cookie sheet for roasting the garlic. Worked perfectly. The house smelled AMAZING, like my Italian grandmother was cooking for the family. If I was Italian, that is. This recipe has you frying boneless chicken breasts that you coat in flour, rather than actual chicken wings. I was a bit skeptical at first, because I don’t fry things. Ever. Not even eggs. Sunny side up, sure, but not fried. I digress! I don’t have a deep fryer like she recommends, so I filled a cast iron skillet about 2/3 of the way with vegetable oil, put the burner on medium high, let it warm for 8 minutes, then began frying my chunks of chicken. 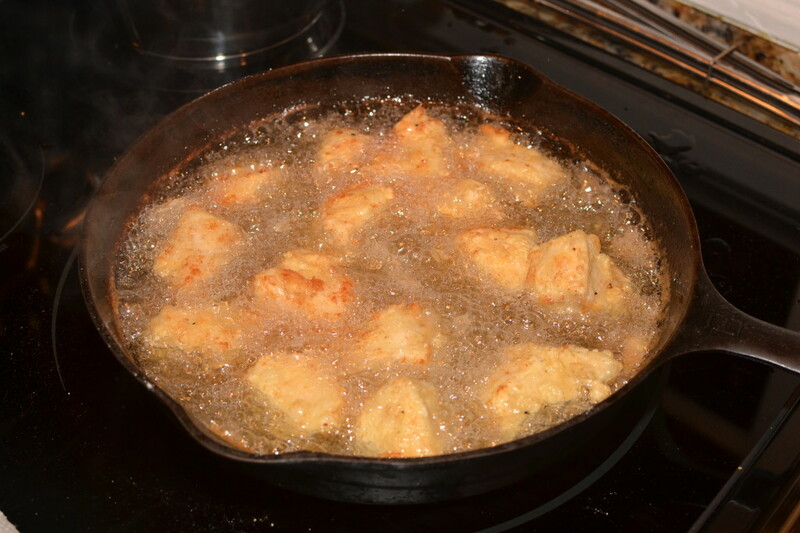 I turned them once or twice, and cut into one after about 8 or so minutes frying. PERFECT! I call it beginners luck. So, after you fry up the boneless chicken breasts, toss them in the sauce, and mangiare. That’s Italian for EAT! Now, what about the wine? I went with three very different red wines. One was a Garnacha from Spain, another was a Petite Sirah from California, and the third was a Grenache, Syrah and Mourvedre blend from the Southern Rhone in France. 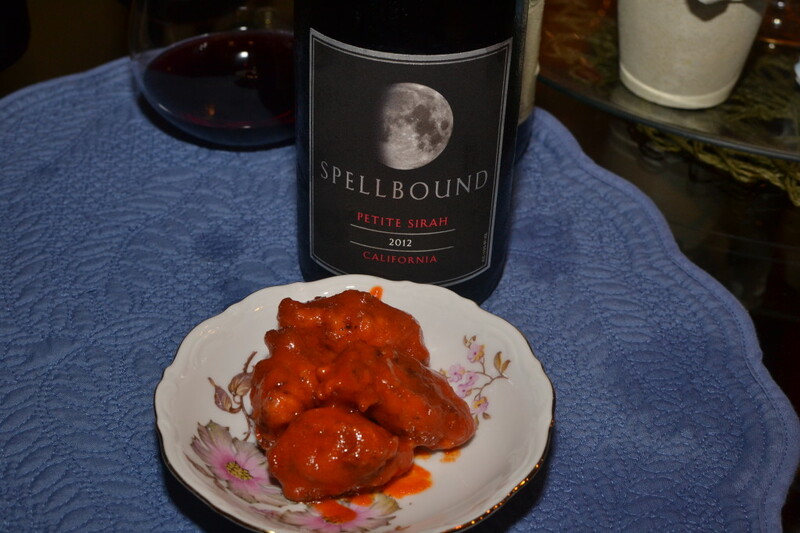 Though perhaps not the best example of Petite Sirah in the world, the Spellbound 2010 Petite Sirah from California was the best wine to pair with the hot wings. The fresh California fruit really balanced the heat from the Sriracha hot wings perfectly. The Spellbound Petite Sirah was a “Grocery Store Wine” that cost around $15. The aroma is ripe red raspberry, with hints of chocolate, and is very inviting. The palate is soft silky red fruit, not super complex or super structured. It’s definitely a California porch sipper, but I think it’s a nice wine and the hot wings are perfect with it – all fruit balances all heat! 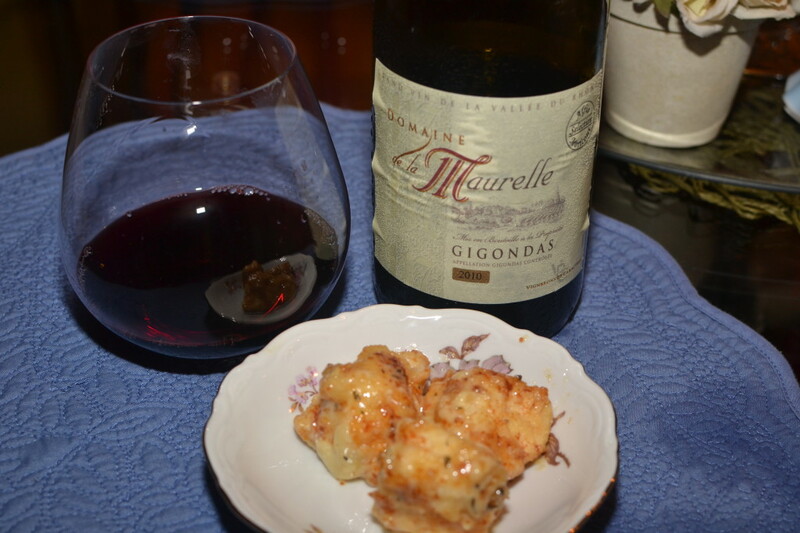 The Domaine de la Maurelle Gigondas 2010 was a very nice, but very different wine to pair with the chicken wings. This blend of Grenache, Syrah and Mourvedre has a spiced black and blueberry aroma. The palate is medium mouth feel, dominated by earthy leather on the palate with dried red and black fruit, with firm tannin, as well as some menthol rounding it out. Old world wine all the way, yet nice with the wings. This Southern Rhone red wine cost $25. 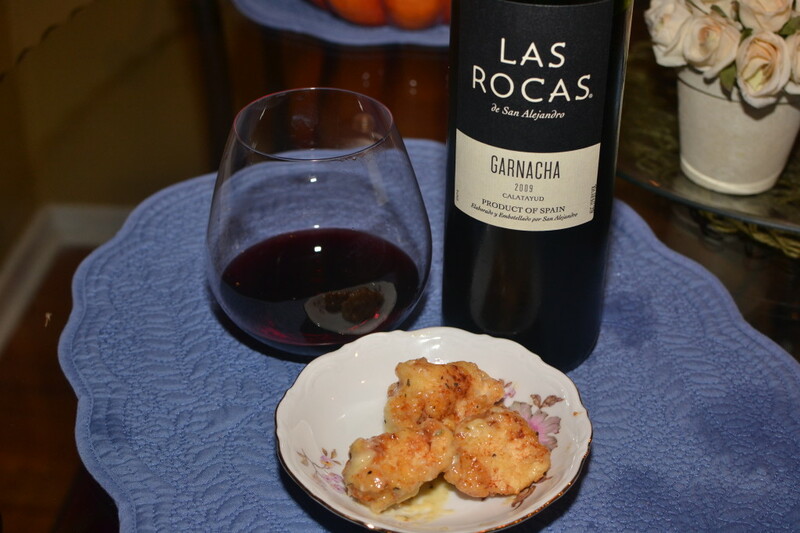 Finally, we had Las Rocas 2009 Garnacha. Disappointed. This was a wine that in 2008 I was singing praises of. Now, I’m just going to say, skip it. The aroma is subdued red raspberry with hints of a leather bound book. The palate is fresh and ripe fruit, with some earthiness. However, there’s a green celery component that really is NOT pleasant. The $15 wine was too simple and yet too awkward to really get behind. However, I believe a nice Spanish Garnacha (Grenache) would be perfect with the Sriracha chicken wings, or the parmesan and garlic wings. 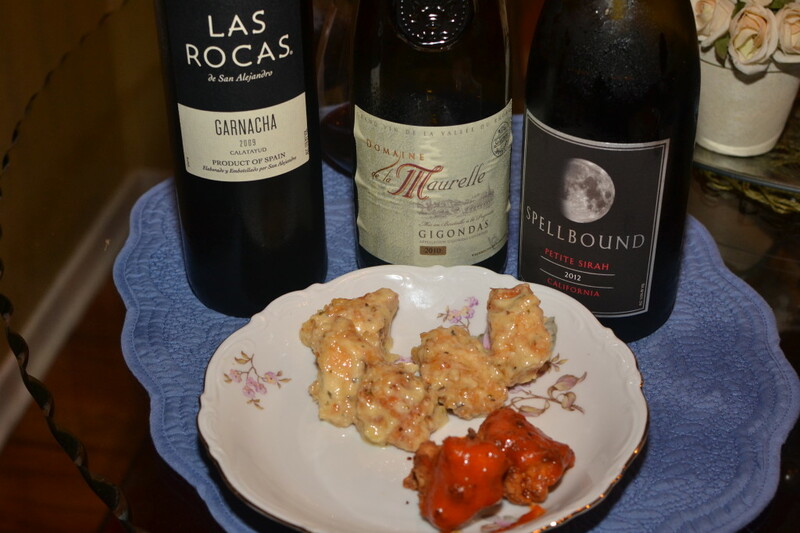 So, there you have it, three, well two wines that pair perfectly with chicken wings for the Superbowl. Whether you go for Parmesan Garlic or Sriracha hot wings, you’re sure to score with the three recipes I linked above. So, tell me, what’s your favorite wine for the Superbowl? And what are you pairing it with? Let me know below, just leave a comment!